You can use memos to tell the story of your project—from your early ideas and assumptions to fully-fledged insights about a topic, person, or event. Use them to 'talk to yourself' as you make sense of your data. Tracking your analytical process with memos can help you to increase the transparency and reliability of your findings. With your process recorded in memos, you can easily demonstrate the evolution of a theory or quickly call up data that supports client questions. Interview or participant memo—summarize the key points of an interview. Make note of contradictions, surprises or early hunches. Include ideas about the nodes you might make and include photos or descriptive information about the interview setting. 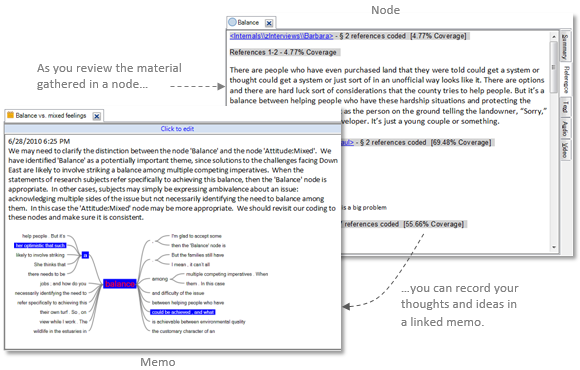 Node memo—explain why you think a theme is significant (especially useful in team projects). Add to the memo as your thinking evolves and include links to the related literature. By writing as you go, you won't face the pressure of staring at a blank document when it comes to writing up your project. Query results memo—what do these query results tell me? Make a memo to organize your ideas and to plan future steps. If you display your query results in a chart or other visualization, copy and paste it into the memo. Analytical and procedural memos—record your findings in analytical memos and use procedural memos to document the methodological steps you take. NVivo memo—record what works best in the software, including any tips or shortcuts you want to remember. Include links to NVivo related support materials that you've found on the web. Many of these ideas come from a conversation in the LinkedIn NVivo Users Group—feel free to join in! Make a note about the body language or voice intonation at a particular point in a conversation. Highlight a word or phrase that needs further definition. Comment on some aspect of the discourse. You cannot code annotations but you can search for a particular annotation based on the text it contains. Point out contradictions between one file and another or within a particular file. Show a sequence of events. Follow a line of evidence.